Are all coprolites large, especially those from the larger dinosaurs? Not all coprolites are large. Individual coprolites can be small—less than 3 inches (10 centimeters) long—even though they came from a large dinosaur. A modern example of this phenomenon is the mule deer and elk of North America. These animals deposit many pellets that are less than a third of an inch (one centimeter) in size, even though these are relatively large animals. In terms of dinosaurs, evidence for this phenomenon comes from a probable sauropod coprolite found in the Morrison formation of eastern Utah. 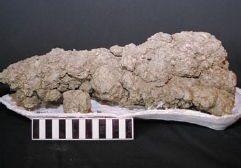 Although this coprolite is about 16 inches (40 centimeters) in diameter, it is probably from a mass of smaller, individual pellets that merged together, probably because of a high water content. Coprolites are actually fossilized dinosaur feces. Not a very glamorous subject for research, but paleontoligists actually discover a lot about what dinosaurs ate and more from these stones. This sample was from a young T rex. Discovered in Saskatchewan, Canada, it is about 17 inches (43 centimeters) long (U.S. Geological Survey).